Actually it is not only a Mad man’s Call,There are lots of Mad men in #Egypt !!. They are objecting to reporting about the wish and intention of the Salafists and radical Islamists to demolish the Sphinx and Pyramids. Those who are against reporting about it are not only radical Islamists, but to our surprise, intellectuals as well. Their reason is why give an ear and importance to an individual case. However, Zeinobia in her article, mentions that these atrocious statements did not originate from one mad man, but from men. Please have a look at her post, as she succinctly mentions all the events and occasions in which this madness is expressed. So they want us to ignore the issue!!! I vehemently disagree, if we stay cool as they recommend us to do, and ignore this matter, one morning we will wake up and find human-kind oldest and most puzzling architectural structures are gone. 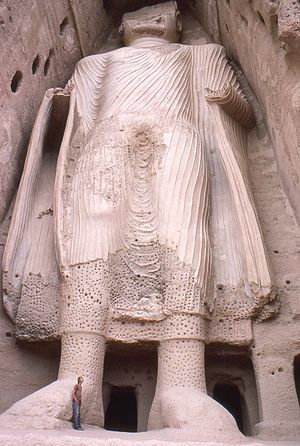 Remember what happened to the massive Buddha statues chiseled in rocks, in Afghanistan. They got demolished because of some narrow-minded ignorant bigots. Those statues were one of man-kind historical artifacts. It exemplified the artistry of earlier ages, demonstrated the technology of their times, and summarized so many stories and years of history. With one look at them, all history becomes vivid and mankind’s ingenuity and creativity is brought to mind. Do they want to erase all this? Is their wish to demolish monuments comes from the size complex? How can we stay silent and ignore such dangerous and irresponsible statements. No, definitely we will not, therefore, Kudos to Zeinobia and to all who are vociferous about any kind of attack on history and its relics. 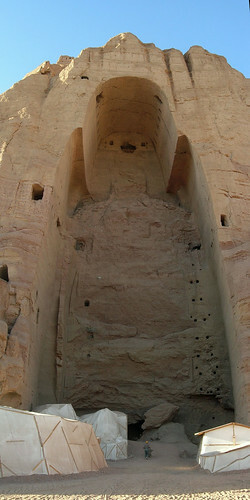 Or do you want us to create holes and emptiness not only in rocks as the picture of Buddha of Bahamian in Afghanistan below show, but also emptiness and holes in human-kind collective memory and history, a deep abyssal and hollow memory as hollow as these radicals’ minds. If the answer is yes, then keep silent and don’t pay attention. No say no to the those: dogmatic, fanatic, extremist, small-minded, prejudiced, chauvinistic bigots.